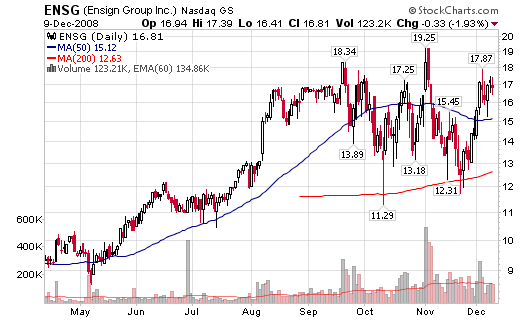 Of the stocks listed Monday (Strong Stock Charts), The Ensign Group (ENSG) and TeleCommunication Systems (TSYS) have the strongest increases in institutional sponsorship from last reporting period to the most recent reporting period. ENSG has witnessed a 26% surge in shares being held this period versus last period and a 303% increase in the value of shares bought versus the value of shares sold. TSYS shows a 24% surge in shares being held this period versus last period and an 81% increase in the value of shares bought versus the value of shares sold. 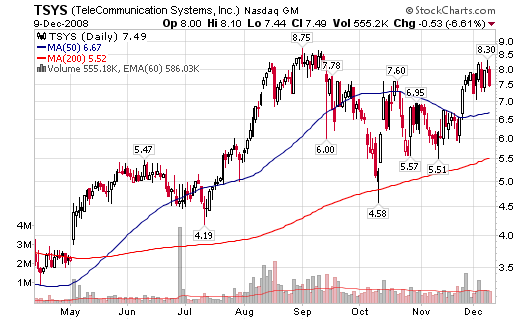 TSYS – TeleCommunication Systems, Inc.
Great calls on AIPC and DXO. How’s baby Perruna coming along? Thanks. Baby P is doing great, we just had the 20-week scans and got some nice 3D face images. Yes, DXO is looking ok but I was somehwat nervous when it dropped into the $2.50’s range. I was also very tempted to grab more shares but I am sticking to the game plan (1/3rd now – another 1/3rd early next year and the final position if a trend confirms to the upside). I wish you a wonderful holiday!